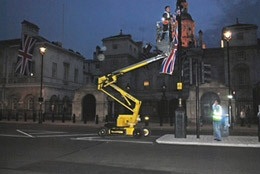 Here Niftylift HR12 self propelled booms are assisting with fitting all the lamp posts down Whitehall outside the front entrance to Horse Guards Parade with Union Jacks. Whitehall being part of the royal wedding route from Horse Guards to Parliament Square and then into Westminster Abbey. We supplied a total of three HR12’s on hire for the job as it all had to be completed by 2.00am next morning as there was a full dress rehearsal of the parade, along with the horses, carriages, cars and armed forces taking place at that time.